dc911truth held the first in a series of rallies in front of the White House from 1:00 p.m. to 2:00 p.m. this Saturday. The aim of the rally was to condemn the current administration for their use of false-flag terrorism, and to alert the public to the likely use of false-flag provocations against Iran in the coming days and months. Matt Sullivan and Webster Tarpley spoke to the small crowd that gathered, and dc911truth members passed out flyers and information cards to curious tourists and school groups in the vicinity. We will hold another rally next Saturday, Feb. 24, at 1:00 p.m., and every Saturday leading up to the march on the Pentagon, March 17th. dc911truth will continue our efforts to educate the public about the hidden history of 9/11/2001 as we forge ahead. We hold meetings every week which are open to the public. If you live in the DC area you are invited to join us for a lively discussion of the issues. altruist on Tue, 02/20/2007 - 6:00pm. card51short on Tue, 02/20/2007 - 6:20pm. 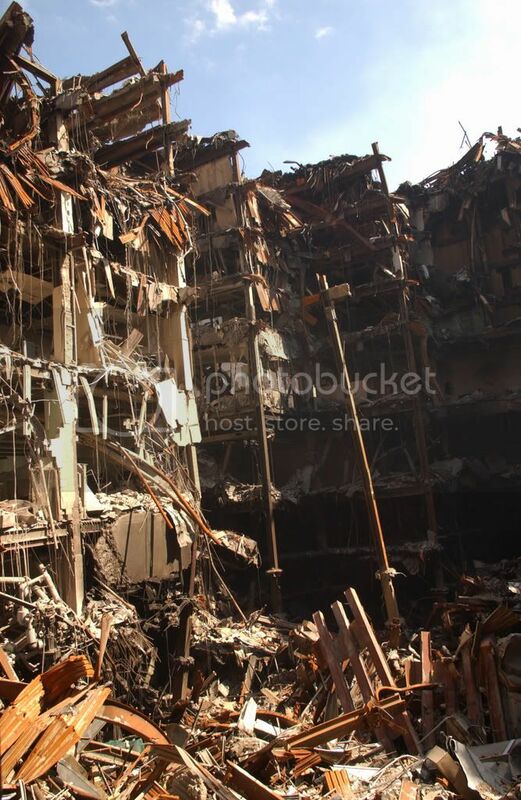 The buildings in the Oklahoma City bombing and 9/11 both share the appearance that they were sliced open. Condition of building the night the NASA team arrived. Building across the street from the Murrah Federal building. Consider this comparison of OKC & WTC . The Federal Bureau of Investigation (FBI) defines terrorism as "the unlawful use of force against persons or property to intimidate or coerce a government, the civilian population, or any segment thereof, in the furtherance of political or social objectives. Amanda Reconwith on Tue, 02/20/2007 - 8:51pm. Jon Gold on Tue, 02/20/2007 - 6:32pm. nothwind on Tue, 02/20/2007 - 6:50pm. card51short on Tue, 02/20/2007 - 8:02pm. Anyone from DC going to Chandler, aside from Webster Tarpley, that is? Time to start planning our summer campaign. LeftWright on Tue, 02/20/2007 - 7:00pm. Anyone going to Chandler from DC? Also, excellent idea about having regular warnings in front of the White House. David Slesinger on Tue, 02/20/2007 - 11:56pm. I promised you an email about my experience with non-violent civil disobedience a long time ago and never got around to it. Maybe we'll have a chance to talk. casseia on Wed, 02/21/2007 - 12:14am. Where is everyone??? Hopefully bigger crowds in the future, this is a great idea. Wish I wasn't so far away. Somebigguy on Tue, 02/20/2007 - 7:14pm. Based on the picture, there were a handful of people present. Many, *many* more demonstrators would be needed. Is it really that difficult to mobilize the numerous 9/11 skeptics there are? Vesa on Wed, 02/21/2007 - 12:12am. No offense, and I mean that sincerely, but 4 people is not a rally. It's the recommended passenger capacity of a Toyota Tercel. I don't know what you are trying to say by posting this photo here. That the 911 truth movement is pathetic and has no supporters? Usually, people have rallies to show solidarity and strenght in numbers. Uh, somehow, I think this doesn't qualify. It's not that I object to you guys showing up. It that by taking a picture, and then posting it here with only 4 attendees, you are projecting the idea that the 911 truth movement is as big a failure as your rally appeared to be based on that photo. metalious on Wed, 02/21/2007 - 1:17am. I think the intention was good, but I'm really surprised that more truthers could not be mobilized. Vesa on Wed, 02/21/2007 - 8:39am. that's three more than we get in L.A. I just wrote something and accidentally deleted it. Maybe for the better, because it was turning into a bit of a rant, although it was a thoughtful appeal. Webster's da man, and hey, I'd rather see the four of them than none at all. At least you could read the signs. I am not going to try and rewrite everything that I just lost, but anyway, I tailed Obama yesterday. First at the rally in the Crenshaw district. I considered going in, or standing on the street with my rather large sign, which is what I decided would be most effective. Then, it was off to the Bev Willshire for the Spielberg fundraiser. I got there early and got a great spot. No streets were closed, so I was right by the driveway. Alot of fancy cars and tinted windows. Pretty hard to tell who was in them. I got a smile out of several people. One who looked like Charlie Sheen, and one looked like Penny Marshall. One huge stretch really slowed down to look at my sign. Obama? There was supposed to be about 700 guests. It started at 5:30 and I was there from 5:00 to about 7:00. I worked the driveway and also Wilshire with possibly thousands of cars going by. My sign said: Obama, want my vote? 9/11 Truth Now. And the standard, Stop the 9/11 Cover-up on the other side. There was one other guy standing there with me who had a sign that you couldn't read that said something about the CIA staging auto accidents. It was kind of fun though, because he kept waving at the cars. I'm sorry I don't have a picture. Maybe if there were at least two Truthers in L.A. I would, which gives you a clue about my rant. In short, if you're in L.A., suit up and show up. This Sunday is an Oscar for Peace demo at Hollywood and Vine at 12 noon. It's the anti-war crowd, but that never stops me. They want creative signs. I've got a Charlie Sheen and a United 93 sign, which I won't give away, but if anyone wants to make this one, go ahead: Another Inconvenient Truth ... 9/11 Was An Inside Job. If you see me, come and talk to me about marching as a group on March 17. I just ragged on the L.A. group for not seeing the importance of visibility. Randy on Wed, 02/21/2007 - 4:40pm. any graphic artists out there? I'm not. So I'm just going to throw this out to the cosmos. I mentioned above this idea for a poster. Another Inconvenient Truth ... 9/11 Was An Inside Job. Someone with the talent could make a really slick (and sick) version of this. Substitute what I recall are smokestacks with the Twin Towers (standing) and the smoke swirling above forms a question mark. And then using the same style of lettering, replace the movie title with the above. These could be used as protest/rally signs and for plastering around. Remember. You heard it here first. Randy on Wed, 02/21/2007 - 4:54pm. There were more than 4 people. We had others walking amongst the tourists handing out flyers. We handed out a few hundred flyers. This was our first attempt and it was a last minute thing. We are going to go out again this Saturday and hopefully each week the numbers will grow. taylor mcknight on Thu, 02/22/2007 - 8:27am.